Catastrophically for this week’s opposition, an unexpected dearth of Front Row players and other team members, reduced the visitor’s team to 11 available men and so forced an unprecedented Home Walk Over to be declared. This resulted in a five league point win for Ripon and a sigh of relief that the club is gathering sufficient points to gradually move away from the relegation zone. Frustratingly, for Ripon; hosting the annual President’s Christmas Lunch, the loyal patrons of the Club, were not treated to the sporting spectacle that they were looking forward to but thankfully the 2nd team were also at home in the North Yorkshire Trophy competition against a strong Middlesbrough side. The strength of the 2nd team this season has been a mixture of old and young and today this was clearly evident with a father/son combination in Mark and Evan Rees. Between them they scored 3 of the 5 tries to secure a 38:0 win and for Ripon to progress to the next round. For the 1st team what did transpire was however, a testament to two clubs committing to good sporting behaviour and thankfully the hospitality extended to the visitors was much appreciated. To Old Grovians’ credit, they travelled with as many players as could walk and put in a sterling and quite testing performance in what was played as a friendly game – and you don’t get many of those these days! After an exhilarating first half in which the visitors found some incredibly tight gaps to run through, Ripon eventually got into their stride and clocked up an impressive six try to three win. Please note at this point, that as a Home Walk Over, the result is represented in the RFU tables as a five point win, regardless of the score from the game. In a game that took the hosts a while to get into, notable for his ability to crop up anywhere, either in support, or in self-initiated attacks, was Ollie Williams, who claimed a hat-trick of tries for his efforts and converted two of them. A good outing in which to continue from his previous week’s service with the Yorkshire U18 Squad last weekend and his selection for the Yorkshire Carnegie Academy Squad this weekend. Elsewhere for the Blues, Tom Graham and Tom Leeming crossed the line in attack and Mainey sought to develop his probing game well at Scrum Half. With uncontested scrums and seemingly uncontested line outs, the set piece pretty much went with possession and it was only in open play that each side was able to make their mark. Grovians made more of the first half opportunities than Ripon and in effectively recycling quickly from the breakdowns, exploited spaces to their advantage. Thoughts now must turn to a number of areas for consideration. 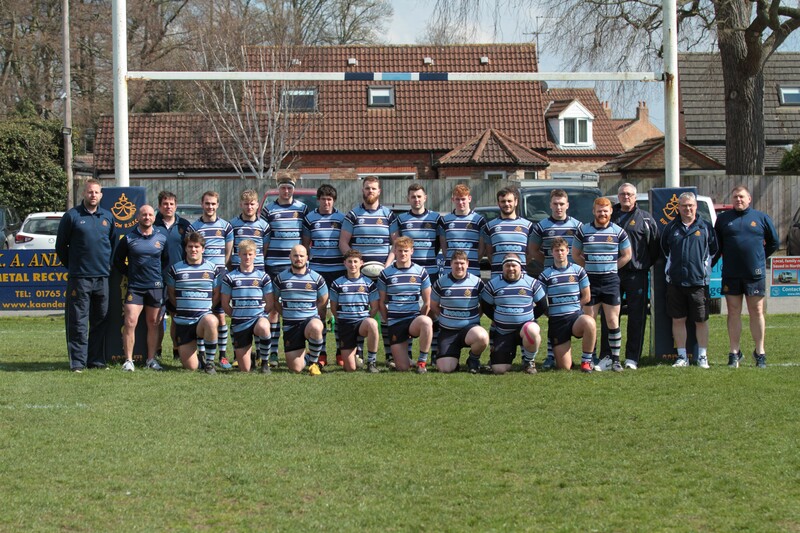 Firstly our empathy goes to Old Grovians RFC and their current player availability crisis. We look at our ability to field two teams and then see a similarly placed club unable to field one, and we must all consider what we need to do to make playing each week a consistent probability. Appreciating that there are numerous other pressures on players, we do need to look at reasons why players play and more importantly, why they don’t. In this vein it might be helpful to reflect, not quite on the halfway point of the season, but with next Saturday’s outcome as yet undecided, on the current state of Ripon RFC. As far as the Yorkshire Division Two position is concerned; going into the Christmas break, Ripon sit in 12th position out of 14, with four wins versus nine defeats. An imbalance that can and will be addressed before the club gets embroiled in last minute survival challenges. Key to any club’s performance is the availability of players who can make a difference on the pitch. Of Ripon’s currently registered male adult players; 39 out of 66 have taken to the field already. Of those first choice players, some 14 remain unavailable for selection due to injuries or work commitments; three of whom are on active duty with HM Armed Forces. What a season we might be having with all, or even some of those currently unavailable players swelling the ranks? A critical component of the Club’s success overall, is the continued investment in the age grade section of the Club, which year on year, churns out quality players for the Ripon and Leeds Academies to choose from. Ironically, the Club is victim of its own success to some extent in that the higher quality youth system players can often bypass the local adult game on their way upwards. We do however, seek to nurture home grown talent and have organically accommodated each year’s adult level entrants with suitable support. For those that are academically inclined, we wish them well in their studies and frequently welcome them back with open arms during vacations and other suitable gaps. This is all in the long term hope that student players will seek employment in the area on graduation and return to the club in due course. For those that are less academically inclined, we seek to work with club members to explore local employment opportunities and this is breeding success as well, in that many current players work with businesses that are closely associated with the club. Of the field, the Club has made significant inroads into the facilities of the grounds and clubhouse, including the upgrading of the floodlights to match quality. The Clubhouse continues to be a welcoming and comfortable environment in which to relax after training, matches, or just to watch some Rugby related sport on TV. The stewardship of the Club remains in secure, profitable and very safe hands and the volunteers that supplement the Saturday and Sunday bar and kitchen teams are much appreciated and highly valued. On the field, the club has benefitted from a well organised and highly skilled coaching and support team. Whilst their contributions haven’t necessarily converted into match wins or league standings; the appreciation of the players goes without saying. The commitment of the coaching team has been integral to bringing new and inexperienced players into seriously competitive Rugby and sowing many seeds for future seasons. To conclude, the Club feels that it could and should be in a higher placed position in the pecking order. The Club and its membership also realises that the achievement of a higher status relies on the unification of player availability and committed coaching. We aspire to align those and do better. Back in League action and looking to put an end to three years’ worth of defeats, next Saturday Ripon are away again at Wetherby at Grange Park. All support is very welcome for the 2.15pm kick off.